Finding a cheap car rental in Christchurch is easy when you use VroomVroomVroom. We compare car hire deals from top suppliers such as Hertz, Budget, Thrifty and Avis. Sort the list by price to find cheap rental cars. Christchurch is a beautiful city in New Zealand's South Island. Restoration work to the city centre after the earthquake lead to new attractions. See various murals painted on building walls as you explore the narrow streets of the city. A rental car in Christchurch is a fantastic way to start your New Zealand holiday. Why hire car in Christchurch with VroomVroomVroom? Christchurch and its surrounds are perfect for exploring with a rental car. Here are some of the reasons why customers choose to book their rental cars through us. Great rates - We have listed down all available vehicles so you can easily compare prices and book a hire car. Get the best deal with our Price Promise. Excellent service. We have been helping people find the perfect rental car since 2001. Let us help you too so contact us now. You can also leave us a message on Facebook and Twitter​. Visitors often wonder about the best time to visit Christchurch. There is no bad time to visit Christchurch, since this city is lovely throughout the year. If you're after warmer weather, the summer months in New Zealand are from November to April. The peak season is during December, February and March. Take note that Easter weekend and late October are also vacation times. If you are planning to travel in this season, reserve your accommodation early. But, in the non-peak months, the weather is still warm and it is easier to find accommodation. Driving from Christchurch to Queenstown is one of the world's great road trips. Take a few days, and go the long way, including a detour to Aoraki Mt Cook, the Tasman Glacier and Lake Tekapo. Another spectacular drive is from Christchurch to Picton. Plan a multi-island road trip and a trip on the inter-island ferry. If the coastal route is not open, you can use the inland State Highway 7, which will take around 6 hours. You are not permitted to take your hire car on the ferry. Leave your car rental in Picton and your supplier will organise you a new one in the North Island. Start planning your trip with our list of the best road trips from Christchurch. There's plenty to do in Christchurch. Lonely Planet listed Christchurch as one of the top 10 cities in the world to visit in 2013, and the New York Times ranked it as number 2 in its list of 52 places in the world to visit in 2014. There's a new energy in Christchurch, and a unique opportunity in rebuilding. Get amongst it! We've made it easy for you, by listing some of the best ideas below. Join Hey Brew for New Zealand's newest and most comprehensive craft beer experience! 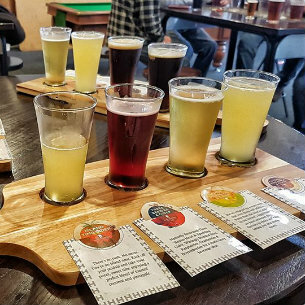 Visit a selection of Christchurch's craft breweries, meet brewers and learn about the differences between beer styles first hand. You're guide is an expert on all things Christchurch and also a passionate brewer. You will taste a wide range of craft beers and ciders and have an afternoon of good times with like minded people. They offer a 5-hour tour called Christchurch Hopper wherein you get to visit 5 breweries and have an option to add pizza at the halfway point. Also enjoy a city tour in between stops. For more information, please click here. Looking for a unique night out? Christchurch is home to New Zealand's only paint and sip destination. You get to relax with a glass of wine, or whatever beverage takes your fancy, while exploring your creativity. A local artist guides you to create your own replica of a New Zealand art work, that's yours to keep! Visit their website to see the calendar of events and book your session. What used to be a 19th industrial precinct is now a premier retail destination in Christchurch. The Tannery features more than 50 boutique shops, restaurants and bars. They also have several function venues including a deluxe cinema. Finding a place to park your hire car wouldn't be a problem since they have free car parking by the beautiful Heathcote river. 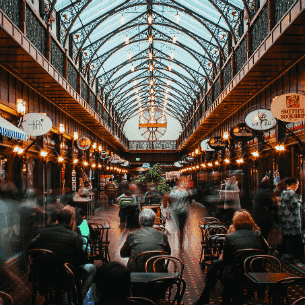 The Tannery is your one stop shop since everything you need can be found here - ranging from homewares and fashion to crafts and postal services. This is also the perfect place to dine and drink as it is home to the famous Cassels & Sons Craft Beer and Brewery. Hanmer Springs is a 90 minute drive from Christchurch city. Here you'll you will find a relaxing day spa, natural thermal pools and waterslides with an alpine background. It is an attraction that the entire family will appreciate. The pool complex is found in the village of Hanmer Springs, a compact town with great accommodation and dining options. The Hanmer Springs Thermal Pools opening hours are from 10am to 9pm daily, except Christmas Day. Dorset House Backpackers provides you with high quality accommodation at a budget price within a historic 1871 home. Recently refurbished, Dorset House is spacious and elegant and is well-equipped with all that a backpacking hostel traveller could need for a comfortable stay (free unlimited WiFi access throughout the hostel). Rooms are bathed in afternoon sun and all rooms are within 3-7 metres of a bathroom. Choose from a variety of room types including double, twin, single, family and dorm rooms (single beds, no bunk beds!). All beds are fully made with sheets, duvets and pillows. Late check in is easily arranged. 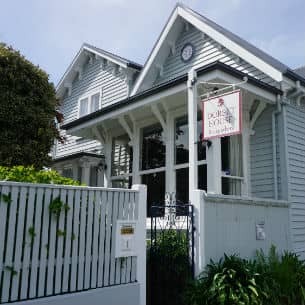 Comfortable, affordable accommodation that is situated a 10 minutes walk from Hagley Park, botanical gardens, and city centre, with tons of restaurants & cafes in proximity. Located at the end of a 70-meter-long driveway, it keeps you well away from busy roads to give you a quieter and more relaxing place to stay. Recipient of Wine Spectator-Best Award of Excellence 2013 and The World of Fine Wine-Worlds Best Wine List 2014, this traditional European cuisine with a hint of modern artistry, provides a classy, sophisticated atmosphere that won't disappoint. Recipient of Tripadvisor's- Certificate of Excellence 2014, this Cafe offers a charming setting for a perfect lunch date. With great food at affordable prices, you're sure to leave with a happy stomach and not with an empty wallet. Feedback: Excellent service, great patience, prompt reply to all inquiries. Thank you. Avis Christchurch Downtown - 150 Kilmore Street, Christchurch, SI. Budget Christchurch City - 150 Kilmore St, Christchurch, SI. Hertz Christchurch Downtown - Unit 4 150 Kilmore St, Christchurch, SI. Thrifty Christchurch City - 150 Kilmore Street, Christchurch, SI.